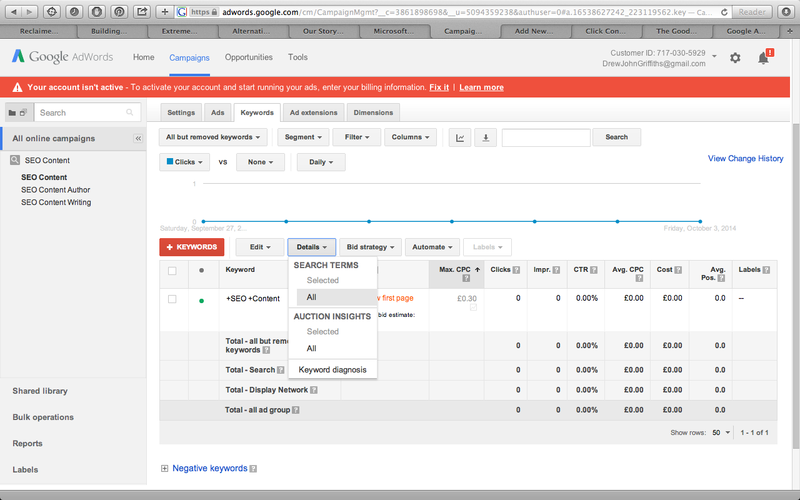 If you are brand new to adwords, then you’ll need to sign up, and then sign in. Create a new campaign by clicking on the ‘Campaigns’ tab near the top, and the clicking the red ‘+ campaign’ button near the left. This strategy works best on Search Network Only. Fill in all the relevant details such as language, location, and put the default bid as a low amount just to start off – we’ll modify that later if necessary. Put in your landing page – this is the page of your website, that you want people to go to, after clicking on your advert. Make it as relevant as possible to the product/service being sold. Now leave this for a second, and open a new tab. Then type in a relevant keyword. For example, if you sell tennis equipment, try searching terms like “tennis balls”. Look out for the longer phrases. For example “tennis balls” may be an expensive keyword to bid on, but a more specific keyword like “used Slazenger yellow tennis balls” may cost less to bid on. Traffic from more specific and longer ‘long tail’ keywords often convert to sales more effectively. This is because people searching specific terms tend to be ‘buyers’ not ‘browsers’. If you are taking over, or giving some love to a pre-exisiting campaign, then you can grab some great keyword data from the account. You should now see a list of keywords/search terms. 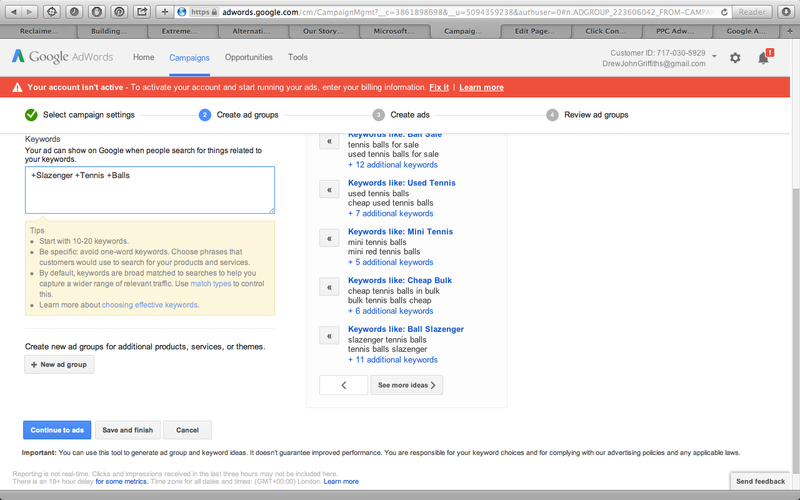 These are the keywords which were typed into google and searched for; and then resulted in your advert(s) being shown. Have a look for any keywords which are completely irrelevant; and add them to negative keywords for the entire campaign. For example, if you have a tennis shop, someone searching for “soccer balls” is not much use. So add “soccer” as a negative keyword in the campaign. To add negative keywords, click into an Ad Group and then click on the keywords tab, then “Negative Keywords” which is near the bottom left (see screenshot above, Negative Keywords is in blue text). 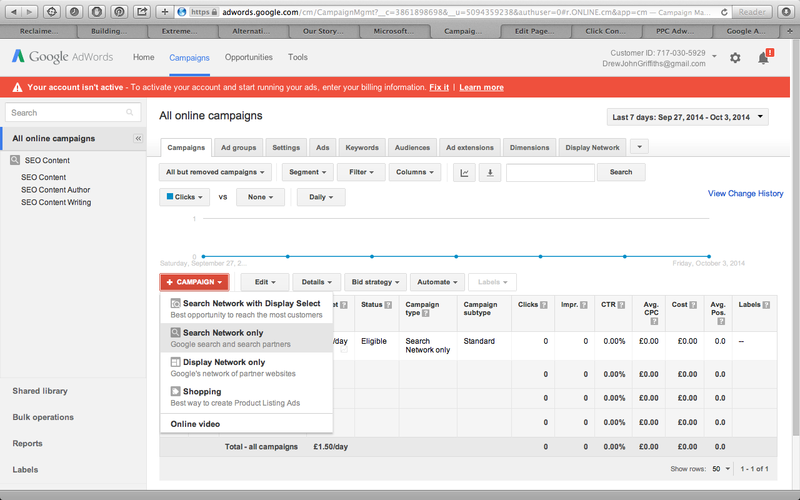 To add a negative keyword to the whole campaign, add in to the list on the right hand side. Find Keywords from the list which are relevant, and which have a high CTR (Click through rate) and/or conversion. For example “Slazenger Tennis Balls” might have generated impressions of your “tennis balls” advert. Create a new Ad Group just for Slazenger Tennis Balls and create 3 to 4 adverts just for Slazenger Tennis Balls. This ensures it is a ‘modified broad match’ keyword. This means that a user much search using a phrase that contains all 3 of the words Slazenger, tennis and balls; or a very close match. When making the adverts, always put a full stop after the first description line to truncate the advert text when it is shown down the right hand side of a results page. Keep Slazenger Tennis Balls in the headline. Add some unique, selling points to the first description. Use hyphens between selling points, and put the first letter of each word in capitals. To finish off the advert click on the ad extensions tab (to the right of the keywords tab). Create an ad extension by click the red button. Try adding “site links”. These are separate links to your website, that will show at the bottom of your advert. Not many people click on the actual site-links, but they will make your advert appear bigger. You could do a site-link for each make of tennis ball that you sell. For example. – Find some effective ‘long tail’ or specific keywords relevant to your adverts, using the KW planner or using the Search Terms showing in your Ad Groups. – Add the keywords with the plus-sign (+) before each individual word to make them modified broad match. – One by one, create 1 ad group for each specific keyword. – Create 3 or 4 different adverts for each keyword. – Place a full stop at the end of the first description line. – Pause the worst performing adverts after you have had them running for a couple of weeks or when each advert has had over 100 impressions. – To make sure that the most relevant adverts show up on searches, it is important to ‘negative out’ the more general Ad Groups. – For example, if we have an Ad Group for “Tennis Balls” ; and another Ad Group for “Slazenger Tennis Balls”; then add “Slazenger” as a negative keyword for the “Tennis Balls” Ad Group. Experiment with 2 lines of selling points, separated by hyphens; and try one line with selling points and the next line with a call to action. In each ad group have a more cheesey & upfront style of text, and an advert or 2 with a more subtle style – no exclamation mark, no call to action. Try starting each word in the advert text with a capital. Keep the actual keyword in the headline. Make your landing page as specific and relevant as possible – e.g. one landing page per brand would be ideal. The less clicks away a purchase is, the better. Remember, people are very inpatient.